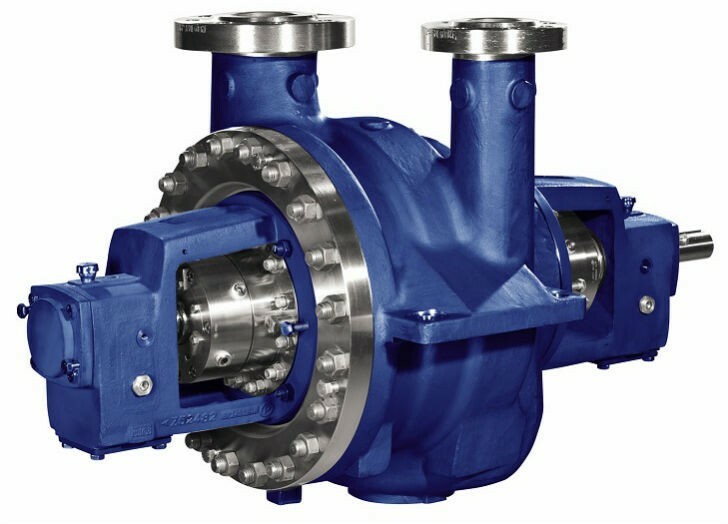 KSB Pumps has introduced updated versions of its RPHb-series pumps for process applications in refineries and chemical plants. The new pumps meet the API (American Petroleum Institute) Standard 610 (11th edition) for BB2-type pumps. The new RPHb API 610 11th Edition pumps are two-stage, long-coupled machines suitable for the most demanding refinery and chemical process environments. They are rated for heads of up to 650 metres and flow rates as high as 875 cubic metres per hour (3855 USgpm). The operating temperature range is from -80°C to 450°C. These rugged pumps feature a back pull-out design that makes it possible to remove and service the impeller, seals and bearings without having to disconnect or move the main casing. They are available in a variety of materials to ensure compatibility with a range of pumped materials, including water and petroleum products. RPHb pumps are available in ATEX-rated models, suitable for use in environments with potentially high levels of explosive flammable gases.